Paul L. Newby II photos | The Grand Rapids PressVolunteers with the Hands Across the City project build KaBoom! playground equipment Saturday at Garfield Park. The hat was whimsical, but Dix took his task as a volunteer leader seriously. He was helping the “butterfly team” assemble a small rock wall for the new done-in-a-day KaBOOM! playground at the park. more easily back into society. On Saturday, he and four men from the home joined 430 other volunteers who participated in Hands Across the City, an all-day outreach event sponsored by the United Methodist Metropolitan Ministry in conjunction with Grand Rapids Parks Department, Friends of Grand Rapids Parks and the Garfield Park Neighborhood Association. 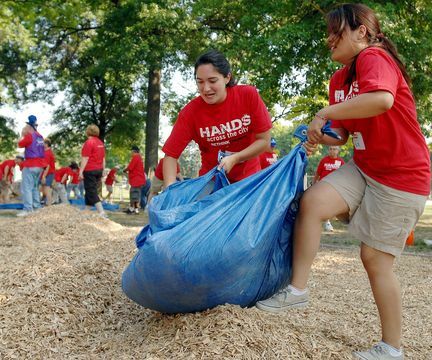 About 300 volunteers installed the playground at Garfield Park. Park, said Jay Steffen, parks director for the city. executive director and Bill Dix’s wife. new KaBoom! playground Saturday morning at Garfield Park. Letting community members have a say and a hand in building the playgrounds has kept vandalism at bay, he added. ground, and familiar playground forms had begun to take shape. things get done with a lot of volunteers. “Nothing is impossible if you donât have to do it yourself,” Lumpkins said. Garfield Park’s was the 1,823rd playground KaBOOM! has built since the Washington, D.C.-based nonproft was founded in 1995.